It seems a far cry from the concert platform to the cockpit of a big Douglas Skymaster, but Len Morey, then a 28-year-old, cheery, red-haired TAA skipper, doesn't regret the change. Len began learning the violin at the age of five. By the time he was 20 he had an enviable reputation as a musician, a music class of 26 budding violinists, and his own string quartet. He had studied under Professor Jack West and Carl Boehm (who later founded the Junior Symphony Orchestra in Sydney), and he frequently played in the Sydney Conservatorium and the Town Hall. He found, however, that the fees from his pupils barely provided a meagre existence, and the string quartette was equally unsuccessful for a less material , but equally valid, reason. But to a keen musician, the future didn't look very hopeful, either economically or aesthetically. Besides, and this is the second reason why Len exchanged his musician's evening dress for the jaunty uniform of an airline skipper, the war had loomed up. Len had learned to fly as a hobby, at the Sydney Aero Club in 1939 and now decided to devote more time and all his available cash, to flying. After running up about 150 hours, he joined a commercial airline. And that was the end of the fiddle. Most of the war time flying was done under charter to the Government and the United States Directorate of Air Transport, and was done mainly between Australia and the islands of the North-West Pacific. Because of the easing of the restrictions limiting pilots annual hours to 1400 instead of the present 1000, Len packed behind him an impressive number of hours in the air. He was flying Airspeed Envoys, Percival Q6s and Lockheeds. In September 1946, he joined the newly formed Trans-Australia Airlines, and a few months later was appointed a captain of the big four-engined DC-4s. 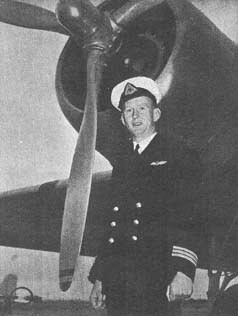 In the 10 years he had been flying, Captain Morey had logged over 7,000 flying hours. Flying was his whole life. He was an energetic representative to the Australian Airlines Pilots' Association. And his hobby was not the obvious one. He rarely touches the violin. For recreation he plays squash - as did most pilots - and was one of the best players among TAA aircrews.